The world's first kitesurfing audiobook helps you to learn this incredible sport in the shortest possible time with the least amount of effort. It has been written with the help of 10 world kitesurfing champions, 17 professional instructors as well as other kitesurfing legends such as billionaire kitesurfer Sir Richard Branson and the author Tom Fuller has over 10 years' experience of teaching kitesurfing. 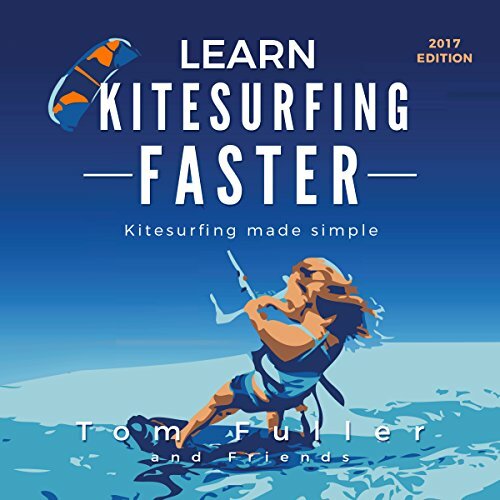 The Learn Kitesurfing Faster audiobook helps you to learn even faster by making kitesurfing as simple, clear, and concise as possible so you can listen on your way to the beach to help refresh your memory on all the most important parts of kitesurfing. It will help to reinforce what you learn in your kitesurfing lessons and give you a massive head start if you are thinking of learning and complements the paperback and ebook versions that have over 200 photos and videos. This is a great primer to anyone learning to kite. It works great in embedding the sport's language into the student. I would recommend it to listen to the audio book after the IKO level 3 license is achieved as means to recap the main topics. Great effort by Tom Fuller and great narration by Nikki Delgado.